What is it? And is it safe to consume during pregnancy? 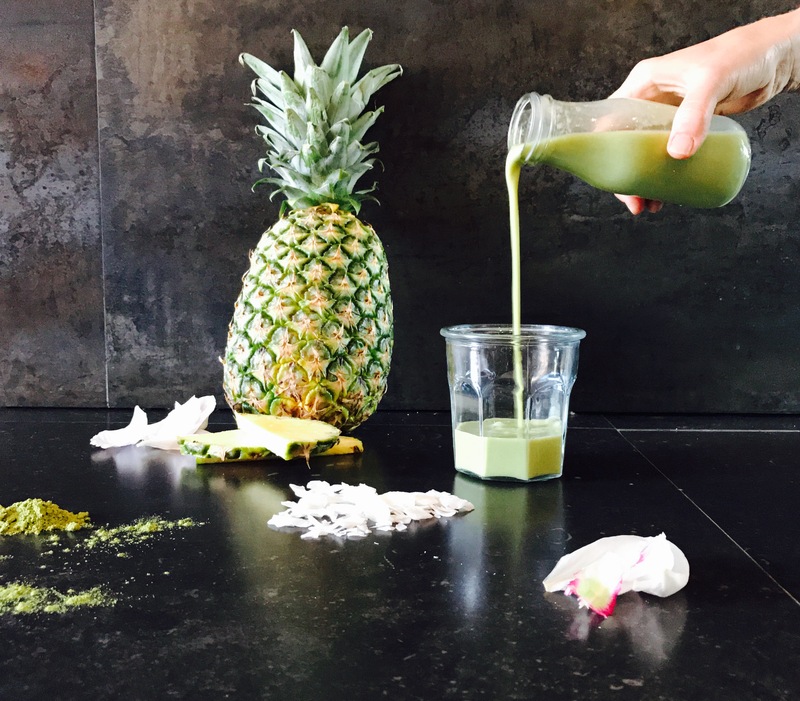 Matcha is “trending” almost everywhere right now and you might think it’s new but Matcha has been around for centuries. What is Matcha? Matcha contains the same nutrients that you find in green tea, the difference being that you are actually consuming the green tea leaf rather than just steeping it in hot water. This means you are consuming a bigger dose of all the active ingredients of green tea. Is it safe to consume during pregnancy? The answer is YES, but as with all caffeinated drinks and food, you need to be mindful and be careful not to go overboard. The general recommendation for pregnant women is not to consume more than 200 mg of caffeine a day. One cup of Matcha has about 70 mg of caffeine and a cup of coffee has about 150 mg of caffeine. It is rich in proteins, vitamin C, and B(1,2,6) and very high in folate – all of which are very important for your growing baby. It also contains a specific amino acid called L- theanine which has been known to enhance alertness without feeling “jittery” like when you drink coffee. L- theanine has been successfully used to treat high blood pressure and anxiety. Another important and abundant polyphenol called EGCG (epigallocatechin gallate) has been shown to improve the outcome of both mother and newborn when the mother has been diagnosed with gestational diabetes. With gestational diabetes on the rise, this is very positive and beneficial information – you can read more about it here. 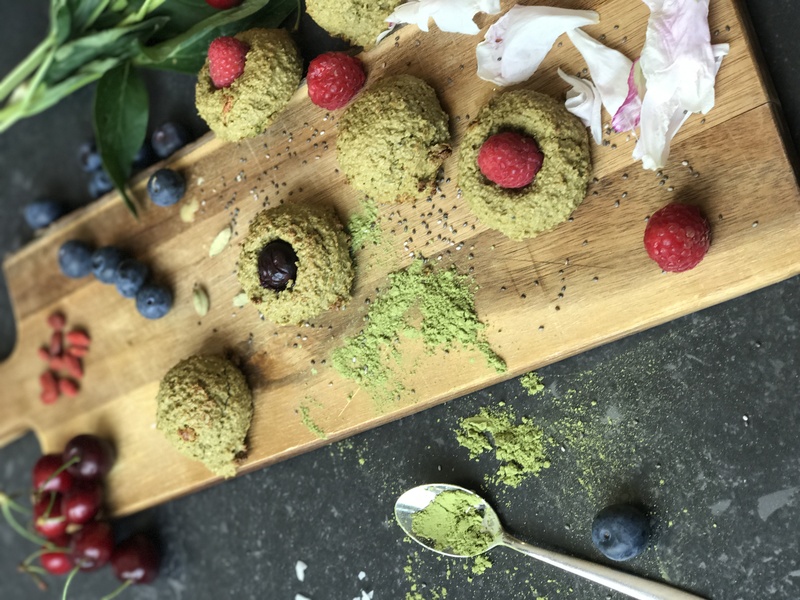 What you need to consider: Pay attention to where your Matcha is grown, since you are consuming the whole leaf, it could contain a considerable amount of lead. Therefore, always make sure you are buying organic high quality Matcha and don’t consume more than 200mg of caffeine a day. Now here is just one more thing to consider: The taste. It can be bitter and if you are not a fan of green tee, Matcha might be hard to swallow. There are fortunately so many different delicious ways you can consume Matcha, because let’s face it, a cup of hot water with dissolved Matcha powder doesn’t really look, smell, or taste appealing. Blend the dry ingredients together in a food processor, set aside. Blend the remaining ingredients together in a food processor. Add the dry ingredients back into the food processor. When everything is blended together, use an ice cream scoop and put the cookies on parchment paper. Optional: you can decorate the cookies with fresh raspberries or blueberries. Bake for about 10 -12 min at 200 Celsius or until you see that the edges are turning golden. Let them cool for a little bit and voilá ! I hope I’ve cleared up the misconception that Matcha is forbidden during pregnancy. Just always remember to be mindful of where your products come from and choose organic. Also make sure that you are not consuming more than 200mg of caffeine a day during your pregnancy.